And then there were three. 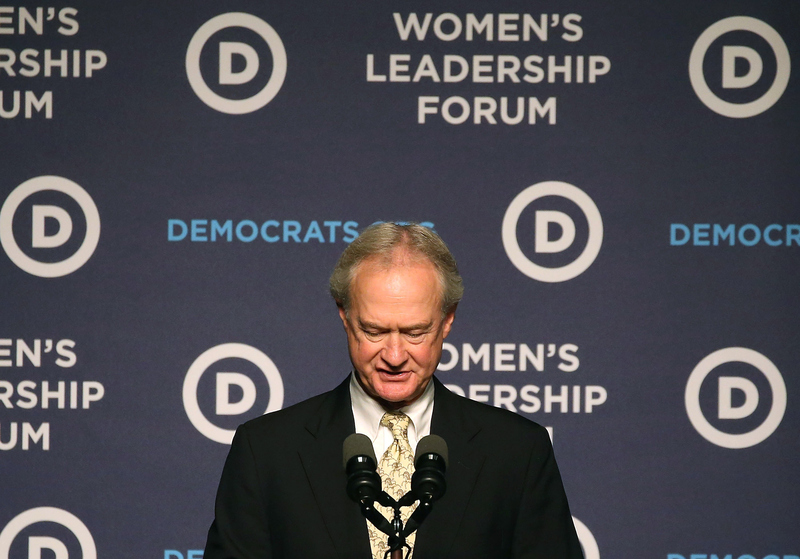 Though the first to technically drop out of the Democratic primary was Jim Webb (with an announcement made earlier this week), Lincoln Chafee has dropped out of the presidential race, which was initially announced by a campaign memo released Friday morning. Minutes later, Chafee took the stage in D.C. to make his announcement. The news doesn't come as too much of a surprise since Chafee, aka the most Mr. Rogers-like person that is not Mr. Rogers, didn't leave much of an impression during last Tuesday's Democratic debate to help boost his low standing with voters. The formal announcement of his withdrawal from the race came on Friday morning. "After much thought, I have decided to end my campaign for president today. I would like to take this opportunity one last time to advocate for a chance be given to peace," Chafee said in a pre-prepared statement by his campaign. Of course, Joe Biden formally decided this week not to run for president either, meaning that the race is down to three: Hillary Clinton, Bernie Sanders, and Martin O'Malley. Chafee, a former Rhode Island three-timer (he has been a mayor, senator, and governor in the state), did hint at a change to his campaign, though, one day before speaking at the Democratic National Congress's Women's Forum. On Thursday, he tweeted that he would "address my future in the campaign there." Turns out, the future meant the end. The former senator struggled to gain even slight momentum in the weeks leading up to the drop-out. Chafee had only raised around $30,000 in his campaign by Oct. 22, The New York Times reports. NPR did a pretty pathetic roundup of all 10 major donors that had given large campaign contributions, making up much of the $15,000 the Democrat had banked. At the same time, his numbers in the national polling data were basically non-existent, sitting at 0 percent for numerous polling organizations. And, like Webb, Chafee's performance during the first debate for the Democratic candidates faced heavy criticism even before the debate had come to a close. When Chafee's sort of heartbreaking response to why he voted for a particular bill was that he was new to the Senate and his father had recently died, moderator Anderson Cooper was quick to ask what Chafee actually meant by it. His "block of granite" comment also didn't do him much good other than a few memes. Farewell, Chafee. It's too bad #FeelTheChafe didn't catch on.